Your vision and eye health are very important to us. That is why we here at Professional Eyecare Associates offer a complete and thorough eye evaluation. We schedule ample time for your appointment so you never feel rushed. We offer complete eye care for adults and children. Our examinations not only help determine the absolute best prescription so you can see your best, but we also do a complete health assessment. This includes checking for such things as glaucoma, cataracts and other eye diseases. We use the latest diagnostic techniques to determine a proper treatment, whether that is glasses, contacts, or even medications to fit all your needs. To schedule an appointment for your eye exam, click here. Our highly skilled opticians are ready and willing to serve your needs. 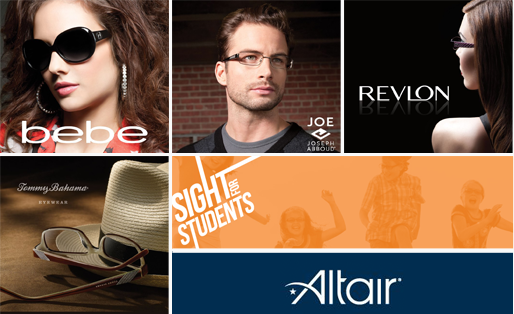 They are very adept at handling any questions or concerns when it comes to your eyewear. We offer a wide range of frame selections and optical services, including adjusting and fitting of frames. 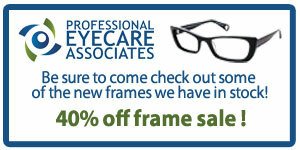 We are also very skilled at helping you select just the right frame for you. We offer a variety of frames and styles including, designer frames, work frames, light weight frames, children and sunglasses. We also have many lens options, including, polycarbonate lenses, progressive lenses, tints and coating, anti reflective coatings, computer and lightweight lenses … all with our exclusive 2-year frame and lens warranty! To view our Annual Contact Lens Incentive, click here. We now carry TOMS Optical Collection. TOMS men’s and women’s glasses are a framework for change. Shop TOMS eyewear for men’s and women’s eyeglasses in oval, rectangle, round, and square frames. With every pair you purchase, TOMS will help give sight to a person in need. One for One®. Our office wilL work to provide the best surgery co-management options that we can. We will work with your ophthalmologist in cataract, strabismis, and retinal post op care. We also offer LASIK and other refractive surgery pre and post op consultations and care. Our contact lens professionals can help find the right contact fit for you. We are highly trained in finding the perfect fit for you. We also are adept at fitting specialized prescriptions and harder to fit prescriptions. If you have had troubles in wearing contacts in the past, we may have some options for you to start to wear contacts again. These include, newer lens materials, treating dry or allergic eyes, and offering different wearing schedules such as daily disposable contacts. We offer a full array of treatment options for eye infections and eye injuries. These include treating conjunctivitis, styes, infections, contact lens abuse, eyelid swelling and pain and many other diseases. We also treat eye injuries including, trauma, cornea scratches or abrasions,eyelid abrasions and removing and treating metallic or other foreign bodies in the eye. Annual eye exams can be very crucial in the management of many ocular diseases. We offer monitoring of cataracts, diagnosing and treating glaucoma, yearly monitoring of macular degeneration and many other diseases. We also offer a complete diabetic eye exam including dilation which should be done every year. We will monitor your eye health in diabetes and if further evaluation is needed, we will refer you to a retinal specialist for treatment. Do you have dry or itchy eyes, Do they water and feel like something is in them. If so, you may suffer from Dry Eye Syndrome, or Ocular Allergy. At Professional Eyecare Associates, our clinic can help diagnose and treat these problems and help ease the suffering and eye discomfort. Blue Cross Blue Shield, Tricare Prime, Tricare for Life, VSP, Eyemed (some forms) Caprock, Medicare, and United Healthcare.